Brought to you by Nespresso Gourmet Weeks. This is the question I asked myself when I sat down at the double-Michelin-starred restaurant Le Pont de Brent above Montreux, Lake Geneva, for a Nespresso coffee inspired lunch. Every year a small number of Switzerland’s most decorated restaurants open their doors for two weeks from 25 October until 15 November, and offer specially priced set menus, under the banner of Nespresso Gourmet Weeks. This year, 15 Swiss restaurants took part and I was lucky to dine and chat with Stéphane Décotterd the chef at Le Pont de Brent. In the UK a chef like Stéphane Décotterd might have a shelf full of published books or even his own television show. In the dining guide book Les Grandes Tables du Monde he sits alongside Heston Blumenthal, Michel Roux and Alain Ducasse. A native of French-speaking Switzerland, he was born in Billens in the canton of Fribourg and grew up in Corseaux and La Tour-de-Peilz near Vevey. He first thought of becoming a chef at the age of 10 and started his apprenticeship at Le Petit restaurant in St-Légier upon leaving school. Then after working at a few other restaurants, including Le Pont de Brent, and living for two years in Quebec, Canada, he returned to Switzerland in 2005 to work again with Gérard Rabaey at Le Pont de Brent. 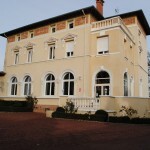 In 2011 Stéphane took over the reins from Gérard. I met Stéphane one sunny Swiss morning to quiz him on his cuisine and his tips for aspiring cooks. Taste is number one. In addition I try to follow the seasons and cook with local ingredients. My cooking is instinctive rather than intellectual combining no more than three or four flavours. Who dines in your restaurant? During the weekends diners are mostly locals. During the week they are from all around the globe. Some weekday evenings there are only foreigners. And they don’t all speak French or English. More and more Chinese clients are discovering us and sometimes they speak only Chinese. We speak no Chinese so communication with these diners requires creativity. I do. I love cooking. It gives me pleasure, especially when cooking for friends and family. You have a young daughter. What is her favourite dish? Pot au feu. And she loves pasta. What is your best tip for amateur cooks? When entertaining, do as much preparation in advance as possible. Entertaining is different to regular cooking. Advance preparation means you can spend more time talking with guests. You need to adjust. 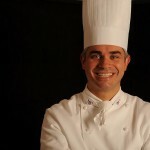 Stéphane has a blog containing tips and recipes. For locals there are recipes using local ingredients such as last week’s recipe Blanquette de Brochet du Lac Léman au Safran. The thoughtful inventive cuisine was varied with interesting contrasting flavours and textures, and was beautifully presented. Service was attentive but unobtrusive, and the ambience was simple, elegant and made us feel comfortable, almost like we were in someone’s home. The vast wine list has a large selection of local wines as well as wines from around the world. I enjoyed an excellent glass of the Chassela from Yvorne – Stéphane’s wife Stephanie (yes Stéphane and Stephanie) is a sommelière from Strasbourg, France, so the wine selection is in capable hands. 1. A selection of delightful amuses bouches. 2. Entrée of young Scottish venison and fois gras – Le maki de Biche d’Ecosse with coffee infused fois gras and espresso crumble. An unusual and inventive take on fois gras. 3. Main of fish – Pollack fillet from Loctudy, with an emulsion of coconut milk, coriander and citronella. Superbly subtle flavours, masterfully executed. 4. Sweet of house-made chocolates and fruit jubes. This also came with a vin cuit sweet that was extraordinarily good. 5. Dessert of hazelnut prailine, coffee biscuit sponge with a sharp citrus mousse. This dessert was surprising and delicious. 6. 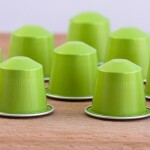 Coffee – Nespresso Grands Crus. What else? To this menu we added cheese – a selection of around 20, all Swiss and bought from Jacques Duttweiler, known by some as Le Seignor du fromage, who has a stand at many of the markets across suisse romande. Bread was also served. Stéphane’s bread is excellent and is made by Jean-Marc Bidlingmeyer in Chexbre. Would George Clooney approve of Stéphane Décotterd’s Nespresso inspired cooking?